Great Blue Heron. Bird Watching Great Blue Herons. Description - This bird is grey-blue with black stripes over the eyes and black streaks on its white foreneck; the bill is yellow. Ornate plumage on the head, neck and back decorate the breeding adult. Heights average 39-52 inches. A harsh squawk characterizes its call. Distribution - The Great Blue Heron resides along lakes, ponds, rivers and marshes from coastal Alaska, along south-central Canada to Mexico on the west coast. Biology - This adaptable birds large size enables it to prey on a variety of animals including fish, mice, small birds and insects. This wide variety of feed enables the heron to stay farther north during the winter months (as long as there is open water) longer than other species. Most of these birds nest in large groups amongst tall trees or in reedbeds; 3-7 pale greenish-blue eggs on a shallow platform of sticks lined with a finer material characterize the nest. 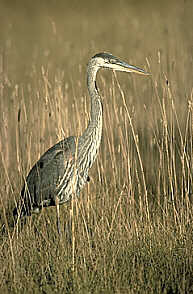 The young herons disperse in the late summer and can be found at small ponds, in mountain waters or wherever there is fish.